We rounded up our favorite ideas, DIY projects included, for how to make your backyard AWESOME. Home doesn’t have to have a designer price tag on it to feel like a place that rises up to greet you each time you return. Ask yourself what you’ll be using this space for the most. A lot of people like to use their outdoor areas for entertaining. So when they start redecorating again, they’re looking for ways to make a station for drinks or food prep. Maybe it’s time to add a sound system at long last. If you’re already known for throwing the greatest parties, built-in speakers are an investment, but so worth it. Is an outdoor escape from your busy 21st-century world what you want to make? Add some water sounds to break up the background noise from your neighborhood. Water looks beautiful. Whether in a fountain, pond... or even a creek running across your yard if you’re that lucky. Water doesn’t just look good. Its little gurgles will help you relax too. There are so many easy fountain DIYs out there. Having a water feature is more accessible than it seems. Remember the times you went down that overgrown path, or explored a clump of trees, and found a secret little spot? You felt like it was just for you, and you felt calm in that secluded hideaway. If you have a backyard, it’s easy to add little surprises for yourself. Go all out and make some landscaping changes. The world can always use more trees, and if your neighbors are a little too close, trees add privacy without detracting from the view. My childhood backyard had a hill with a path tucked between it and the fence. I loved nothing more than playing among the rocks, flowers, and herbs my parents lined that pathway with. Even if an apartment balcony is all you’ve got to work with, a few potted plants make all the difference. Using more rugs outside is easily the most under-rated way to transform your backyard. Less dirt gets on your feet, your outdoor space feels upscale. You might think, it’s outside - is using an outdoor rug really necessary? It feels like you’re spoiling yourself, but you’re really not. You’re just making use of the space you have, so you use it more often. Outdoor rugs make space feel finished. Almost always, a rug is an awesome way to add contrast and pull the space together at the same time. It doesn’t even have to match your furniture. This is the one thing that gets easily overlooked but makes a big difference. Most people don’t think there’s a point to laying down an outdoor rug just for it to get covered with dirt. Even though it’s outside, having a spot to relax your bare feet that isn’t grass, dirt, or wood is a nice change of pace. If you’re still on the fence, think about it this way: without a rug, anytime you go barefoot, you’re instantly reminded you’re outside. Has your deck gotten old and taken to shedding splinters? Have a patio? Did you notice how much colder it got underfoot when the sun went down? And during the day... sometimes that stone is hot enough to burn your bare feet. Wouldn’t you rather have your feet protected from the dirt, and cozy on a rug? Imagine the shock - you’re barefoot relaxing on your new couch with your feet up, and when it’s time to grab snacks, your feet feel concrete, dirt, and dead leaves. It might be personal bias, but cozy on a rug sounds a whole lot better. Not everyone has a backyard. But pretty much all of us have some sort of outdoor space at our disposal. Bring your favorite things about inside, out, and expand your living space. You want your outdoor space to be comfortable. In other words, you’ll be lost without good seating. If you want people to stick around for awhile, they’ve got to have a place to rest. It doesn’t have to be fancy. Just enough for a group to sit around and talk together, with their drinks and snacks in easy reach. You could have a wood picnic table, and people would be happy. But a couch you can sink into is always the real winner... It might be worth considering how you could make a couch work with the rest of your outdoor furniture. Idea: take an old wood, or metal, daybed frame and convert it into the most spectacular couch you’ve ever seen. Outside is hands down the easiest place to collect "found things" for. Is your neighbor getting rid of their old outdoor furniture? Do you have an old dresser you’re ready to repurpose? It’s fun to see the difference spray paint and new throw pillows make. Having a mix of different textures adds visual appeal anyways, and being able to say "thanks, I made it" adds to the satisfaction. The key to a successful outdoor getaway is defining the space. Arrange your furniture so there’s a clear walkway. Use curtains to add some protection from bugs, or just a pretty way to give yourself privacy. 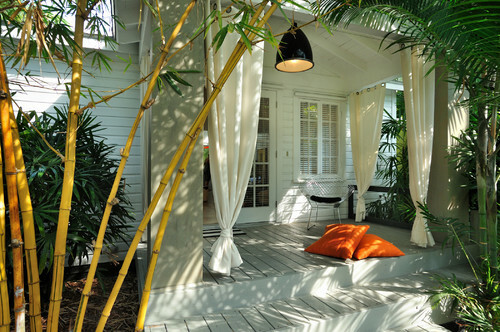 A pillared porch with curtains blowing in the breeze is simple and stunning. Can You See? Turn on the Lights! Think of lighting as the secret ingredient in a recipe that makes it a million times better. You can make mediocre lighting work, but your outside paradise could be so much better than that. Night parties are stark, and not as much fun when you don’t have a better solution than the standard backyard flood light. This is the time to think outside the box. Torches, fairy lights, even a chandelier of candles. Whatever it takes to add a little sparkle magic. You can probably get away with having the simplest outside setup if your lighting is good enough. Solar lamps come in lots of different colors. Stick a few scattered throughout your plants and make the colors a personal nighttime light display. Talk the night away with your friends under twinkling lights and it will feel special without any extra fluff. If there’s one design tip I wish everyone knew, it’s how to create a focal point in a space. Indoor or outdoor, your eyes need somewhere to be directed to. What you see first is often what you remember the most. Just because it outside doesn't mean you can’t have art on display. Make sure it’s weather-friendly and you’re good to go. Want people to take their shoes off before coming inside? Make a sign that doubles function and beauty. Take a collection of glass bottles and dishes and show off your rock collection. There you go, focal point made. Are you a birdwatcher? Make a birdbath, and frame it with an assortment of plants... maybe add a path leading to it. Whatever you do, give your eyes something to go towards. Mirrors don’t have to stay inside. The way they reflect light brings the glamour outside. side. The way they reflect light brings the glamour outside. One of the sneakiest ways to make a small space feel bigger is to use a mirror. Hang a big mirror, or a collection of little mirrors on a wall that’s stuck in a dark corner, and watch the light flood in. It takes patience, but vines are a colorful and pretty source of shade. They’re totally worth the wait. Ever thought of making walls with trees? A leafy canopy is always stunning. But take it a step further, and make your own outside palace. There are lots of clever ways you can use them to make your outdoor space feel like a secret hideaway. 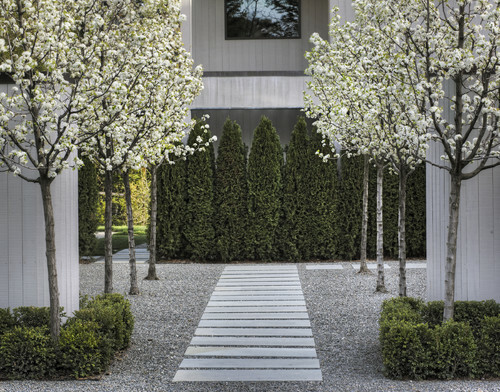 Every backyard needs fire, water, and earth (and a little shade) according to landscape designer Michael Glassman. He’s right, of course. I wish I could take the credit for this, but in the absence of that, I’ll settle for sharing it with you. Without a good source of shade, about 80% of the day isn’t relaxing in the direct sunlight. Water has such a soothing sound, just being around it will help you calm down. I’ll let you in on a secret here - it also adds a natural cooling effect. No joke. If the place you call home has those summers that get unbearably hot, a water feature of any kind will make the heat a little more bearable. Without earth, plants are unable to grow. And what’s the point of having an outdoor space to relax in if it doesn’t include plants? 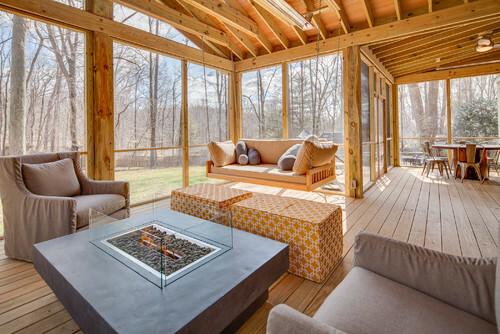 When it comes to making an outside hideaway, fire is almost always a good idea. If you have the space for it, outdoor fireplaces are awesome. They generate heat so you can still hang out in the winter. The best part? Whenever you feel like making smores, it’s right there anytime you need it. A lower-budget option is to either build or buy a fire pit. It might not look as fancy, but no one will be complaining. That being said, glass fire pits are more accessible than ever. Gone are the days of budget-friendly means sacrifice on style. No matter how impressive the setup looks, the smell of a wood-burning fire is just as good. If a fire pit isn’t an option, and you still want the same feeling that a fire gives off, try getting creative with candles. They come in sizes big or small, and you can put them in pretty much any kind of open-air container. At the very least, you can add a few torches, just to keep the mosquitos at bay. Sitting down to a good, long conversation gets better when you do it fireside. Maybe it’s primal instinct, but sitting by a fire makes the conversation flow like water. Water, fire, and earth make up most of the basic elements. There is something in our very nature that revels in having these things close by. So be good to yourself. No matter the size, give yourself space where you can spend time outside to relax. If you’re thinking about making an outdoor space, consider how you can use all of the elements. Water cools and soothes. Fire warms and comforts. Sitting in the shade surrounded by plants gives the earth a chance to help you feel grounded. I don’t know about you, but I feel like a better version of myself when I spend at least a few minutes outside. Consider it a health expense, and make your own outside sanctuary. And if you forgot the best part, it doesn’t have to break the bank to be just what you need.